About four months ago, I took a two-day class with Steve Latta. 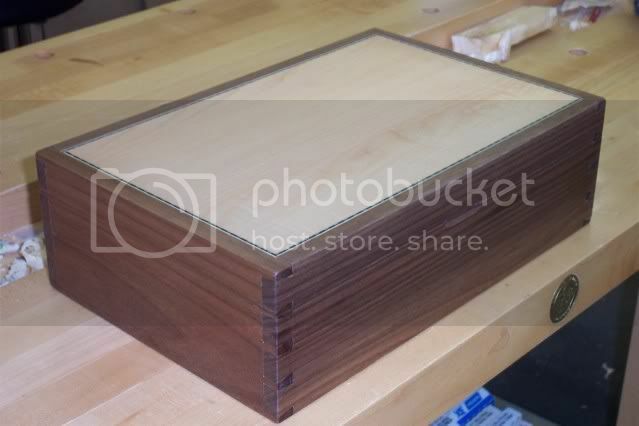 We built a dovetailed box with some inlay and a veneered lid. The idea was to learn a number of techniques in this one project. The box sat in my home workshop nearly finished since then. I knew that there were some problems with it. In the class, I was not able to work at my usual glacial pace and still keep up well enough to get everything that I could out of the class. 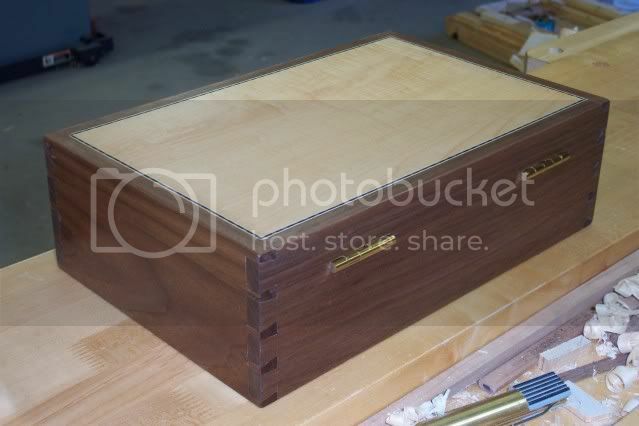 A few days ago, I decided to complete the box and use it in my workshop to store some loose router bits. As I started to work on the box, I realized that this was a great opportunity to try techniques to fix some of the problems without risking totally messing up something that I had spent a great deal of time on. I did the following. 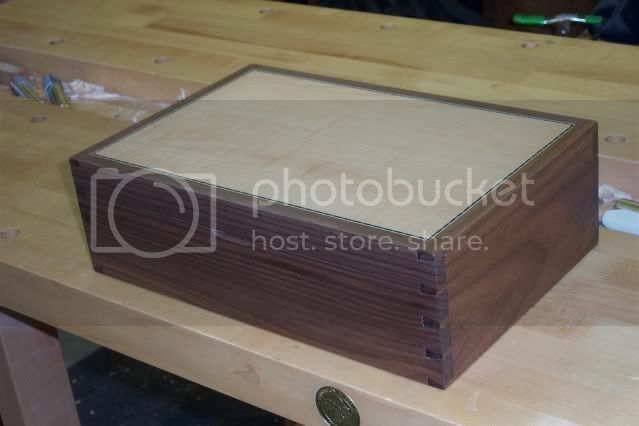 I filled some voids in the dovetails with pieces of matching black walnut, as has been discussed in several LJs threads. I concentrated on the worst spots. and it worked out quite well. The hinges were not mounted properly. The lid was rotated noticeably with respect to the lower part of the box. Besides looking sloppy, this caused problems between the lid and the tops of the cedar inserts. I removed the hinges and drilled out all the screw holes. Then I glued in pieces of 1/8” dowel. Once dried, I shaved them flush with a chisel. Then I drilled new pilot holes and remounted the hinges – properly aligned. When I applied the Danish Oil finish, I noticed some glue spots on the joints. Normally, I remove excess glue after 20-30 minutes when it is in the perfect rubbery stage, but I was not able to do that in the class. So, I tried Huckleberry's glue erasing technique and was very happy with how it worked out. I am glad that I had the opportunity to try these techniques and get some confidence in using them. After all this, I decided to put the box on my bedroom dresser instead of leaving it in my shop. Here are some pictures. It is not perfect. But it is a great improvement. I wish I had thought to take some pictures before the surgeries. 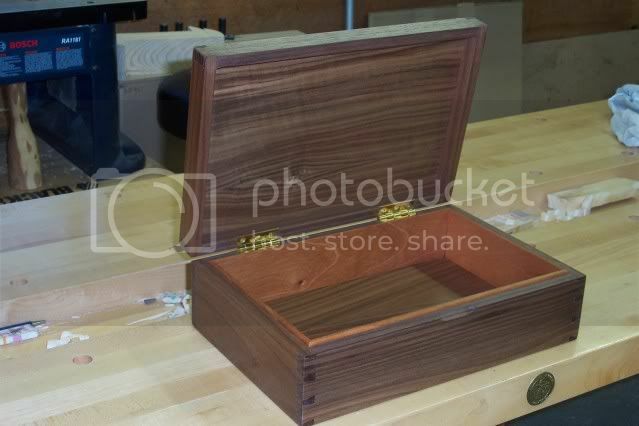 You must have a classy workshop – looks too nice just to put router bits in!